If you need eye-catching ads in high-traffic areas, outside your storefront, and at conventions, custom banner printing is what you’re looking for. 48HourPrint.com’s banner options have you covered for creating any display or marketing tool you need. We offer four different banner products, each with a wide variety of customization options that let you make whatever banner you need. Banners are not only versatile, they’re extremely practical as well. Use custom banner printing to advertise special offers inside or outside of your store. Use them for advertisements and to announce special events outdoors. Banners are also an important part of conventions and other special events. Set them up on your table, or use retractable and x-stand banners for a quick and easy way to attract customers to your display booth. Use large step and repeat banners to add a touch of class and dominate any event. Vinyl banner printing offers durable indoor and outdoor advertising with excellent value. They come with your choice of pole pockets or grommets. Use grommets if you want to hang banners on hooks or ropes without damaging the banner. Choose pole pockets for neat, ready-to-hang banners you can set up with any suitable pole. 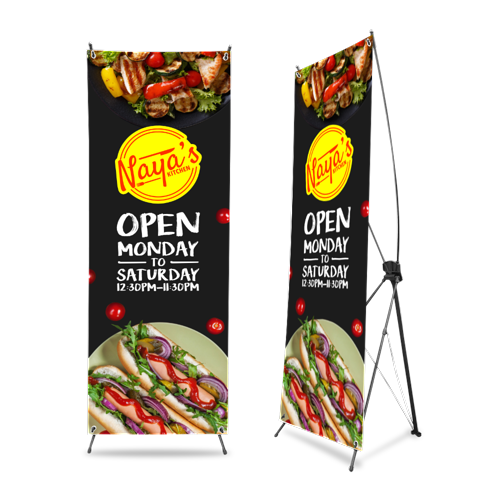 Retractable banners are the perfect material for pop-up stores, food trucks, and any mobile business that needs large advertising to go with them. They come in three sizes and are shipped with their own silver-colored stand. These are the perfect banners if you need to change ads regularly. X banner stands let you take down the old banner and pop in the new one within seconds. Need a new banner? Just order a new 24” x 70” vinyl banner with grommets and you’re set. This makes them just thing for advertising in reception areas and for restaurants that need to regularly switch out special offers and menus. Step and repeat banners are the printed backdrops with repeating logos and images you see during red carpet events. They’re a must for any big event, adding a touch of glamour and setting the tone for everything else. They’re also especially important in today’s social media age. Order them for your events to create limitless impressions online when guests take pictures and share with your branded backdrops. Pole banners use common outdoor lighting and utility poles to display your ads. Custom pole banners are popular with gyms, advertising agencies, event organizers, and other businesses that need to advertise outdoors. 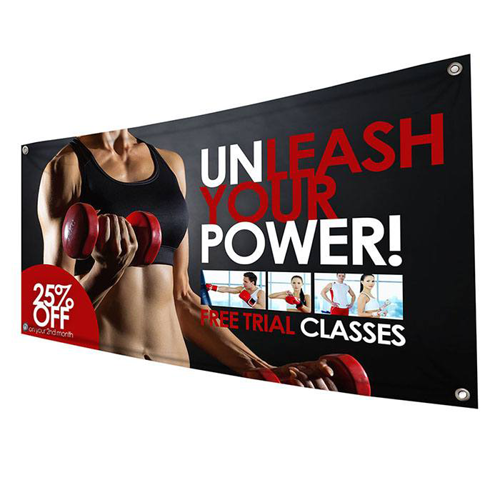 Pole banners can be ordered with either street pole mounts or wall mounts, letting you display them virtually anywhere. 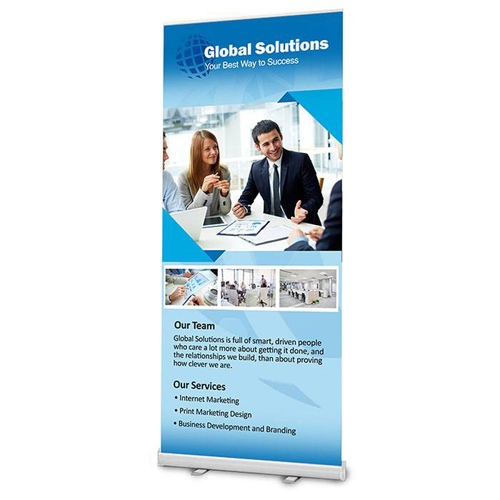 Pole banners can also be printed on both sides for better visibility. Use them to effectively reach out to both pedestrians and drivers. Mesh banners are popular as outdoor signs, building wraps and construction fence banners. They can be used much like any other vinyl banner with the added benefit of more wind resistance. Fabric banners are made of high-grade 9 oz. polyester. The tightly woven threads allow colors to really stick to the fabric, producing vibrant colors that look great in all angles. Moreover, the tight weave makes the banners tear and scratch-resistant, making them perfect for indoor and outdoor use. Order fabric banners with grommets for easy hanging or pole pockets if you already have a banner stand. Start your custom banner printing today. Find the banner options you need and print banners as fast as 1 business day. Check out this article on banner font size to help you get started.